There is no worry so great that it can't be eased by watching green things grow. A garden, no matter how small, can become an important area for releasing stress and finding hope. We're getting frequent visits from rain clouds. Rain is a constant visitor, dropping in on us at any time without warning. This is the perfect time to maintain one's terrace, verandah garden or sitting place with natural plants to keep it eco-friendly. All to often, what disrupts our inner peace is not weighty world events but life's petty annoyances. The ringing of a cell phone or booming music from the house next door intrude into our private space. A missing pay check, a tardy employee, a traffic jam and countless other delays and inconveniences try our patience. A broken light switch, a baffling computer program or an uncooperative teenager can-push us to the edge too. To ease the stress of life's petty annoyances and frustration, concentrate on rearranging the flow of energy through your home. The world beyond our window is easy to forget. When you connect with nature you are also connecting with your spiritual self. Homes designed for peaceful living often blur the boundaries between indoors and outdoors with rooms that extend into gardens. Living room, verandah or terrace attached with green: It is especially important to make sure that your home feels nurturing and life affirming. 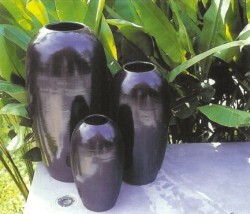 You can easily decorate your living area and verandah abundantly with living plants in hand crafted pottery. A ceiling-high Ficus tree and hanging fern will bring their own quiet energy into your space. While they feed the spirit, plants also benefit your physical health. Some researchers believe that certain varieties of ordinary foliage help cleanse the air. Fresh cut flowers will also bring a spirit of renewal provided that the water in which they are kept is changed. Feng Shui and common sense suggests that you replace fading flowers with fresh blooms. You can use warm earthy colours such as brown, green, gold and deep russet for your upholstery fabric and shimmering silks for cushions this season. Use small table lamps with warm incandescent bulbs to define areas with cozy pools of light. Carpets can also be very effective in establishing the sense of a room. Sound and Music: The air is never still. Every movement, every object sends out the vibrations that we perceive as sounds. Some of the most soothing sounds come from nature. Surely there is nothing more peaceful than the rustle of leaves, the pitter-patter of rain or the chattering of birds especially during monsoon. 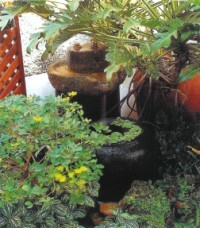 We can thus use a tabletop fountain or a small indoor pond fountain, or even a local chari for water hyacinths or lotuses. Arrange a lovebird cage or aquarium lovingly in a corner of your patio. 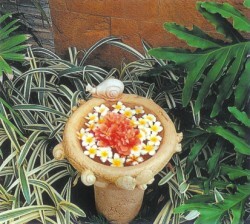 The open air, cloudy weather and the music of water falling will work together to encourage you to feel monsoon. Both vocal and instrumental sounds are truly food for the soul. Thus if we are little conscious then, we can easily arrange a switch socket for a music system in the verandah or patio or near our open green space. Wall and Floor: Enjoy the rain in your home from the comfort of your verandah or patio. A verandah's wall is the vital part of the decor. Generally we use a continuous wall in our verandah. Today we can change our style. 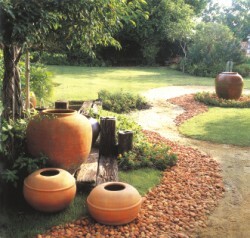 Use terracotta or sand stone on a portion of the wall. You will easily get an earthier feeling. 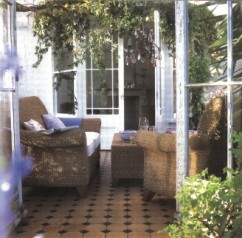 We can also put tiles in our green space. Clay, sandstone or rustic tiles can also bring a totally different look. To create a small heaven on your earth, look for spaces that can be transformed into an indoor garden. The obvious choice is an enclosed sun porch but you can create a green room anywhere there is light and ventilation.